when i changed the ornaments on my little year round tree from december/christmas to january, i thought they needed a little update. i had some blue mittens with the snowflakes before, but i kept thinking about the new mittens from the saltbox brrrrr set. i thought the different patterns on them was perfect for adding a little more color to the tree and the size was just right. i love the outcome! and now i have a new set of november ornies! the little pilgrim faces and the corn from the kid's table started it off, but i really needed at least five different ones for variety. the pumpkin and leaves are from give thanks. the pumpkin was a no brainer, and i wanted the leaves to add a little more of a fall color to the set, but i did omit one acorn and cut off some of the stem to make the size and shape work better. it's hard to see in the first picture, but i also made a wire topper to go with the set. when creating these, i have to think of a shape that coordinates with the ornaments, and that is easy to create by bending wire--and that is still recognizable! i think i did okay with the leaf. well if you recognized it as a leaf, of course! i'm so excited to look over and see the tree dressed for fall instead of looking like a regular christmas tree that didn't get packed in the right box! i can't believe it's march already!! 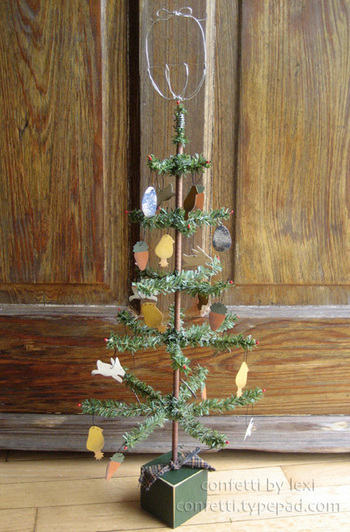 this month, i actually have one of the orginial ornament sets that were sold with the tree--the easter set, featuring little chicks, eggs, carrots and leaping bunnies and a blue and orange plaid fabric ribbon at the base. the friend who got me hooked on the year-round tree had this extra set, so she gave it to me, since i was only able to get one myself. i use it in either march or april depending on when easter ends up. while i have fun coming up with my own ornaments for other months, i love the original ones and really wish i could find them somewhere. they don't feel like paper--more like a stiff canvas and they're painted with just enough of a rustic touch. again, i created the topper myself. it took a while, but i finally ended up with something that kind of resembles a basket! p.s. speaking of easter, beth posted one of my spring cards on the saltbox sampler today--more fun with sheep!! i can't believe i almost forgot to post my february tree! actually, i almost forgot to change it. for february, i found these little charms--a set of metal love charms--at michael's a couple of years ago. the kit contained the perfect number i needed and includes a love token, a "cute" conversation heart, a friends flower, xoxo and even one that says, "moms are all heart." they are mostly silver with a few shiny red details. perfect for february! like the snowman topper last month, i created the heart myself--much easier than the snowman. i'll try to be back with a card later today, but until then, you can see one that i created over at the saltbox sampler--and a few that my girls did too! 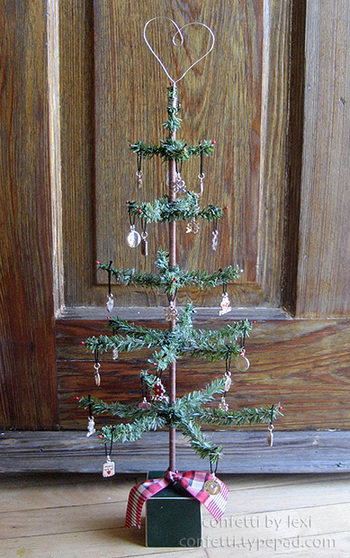 after showing my little year round tree with my christmas trees last month, i thought i'd try to make a point of showing it each month this year. when i purchased it, i only bought one of the ornament sets to start with, thinking i would be able to add to it month by month. but the store changed it's long distance purchasing policy and then went out of business, so i had to start adding my own monthly ornaments. i found miniatures for some months like december, charms for other months and i've made a few sets myself. for january, i have a combo of miniature snowflake ornaments and stamped mittens. 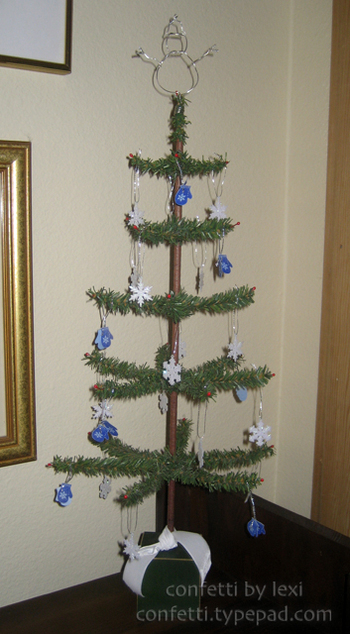 there were also wire toppers to go with the ornaments. i only have one original of those, but here i've made my own snowman. i wish i could find the original ornaments again because i like the look of them, but i've had fun finding and making my own, too. i know snow and mittens are symbols of january, but it sure is hot here!